On May 12, 2018, Doris Helen Fant, 95, of Glen Burnie, passed away at Glen Burnie Health and Rehab. Doris was born on December 9, 1922, in Baltimore, to the late Edna and Alvin Beech. She worked for many years at the Social Security Administration and was a member of the Glen Burnie Moose Lodge1456. Doris enjoyed bowling, playing cards, and Yahtzee. 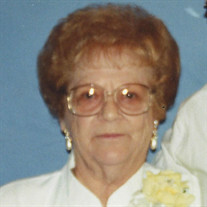 Doris was predeceased by her devoted husband of 43 years, Charles W. Fant, her beloved sons, Franklin E. Kleinsmith, Sr. and Charles E. Kleinsmith, and her cherished great-great-granddaughter, Jaylynn Marie. She is survived by her loving grandson, Franklin E. Kleinsmith, Jr. and her dear great-grandchildren, Ryan and Joey. She is also survived by many other grandchildren and great-grandchildren. The family will receive visitors at Singleton Funeral and Cremation Services, P.A., 1 2nd Ave, SW (at Crain Hwy), in Glen Burnie, on Sunday, May 20th, from 2-4 and 6-8 PM. A Celebration of Life Service will be held on Monday, May 21st, at 10:30 AM in the funeral home chapel. Interment MD Veterans Cemetery in Crownsville.